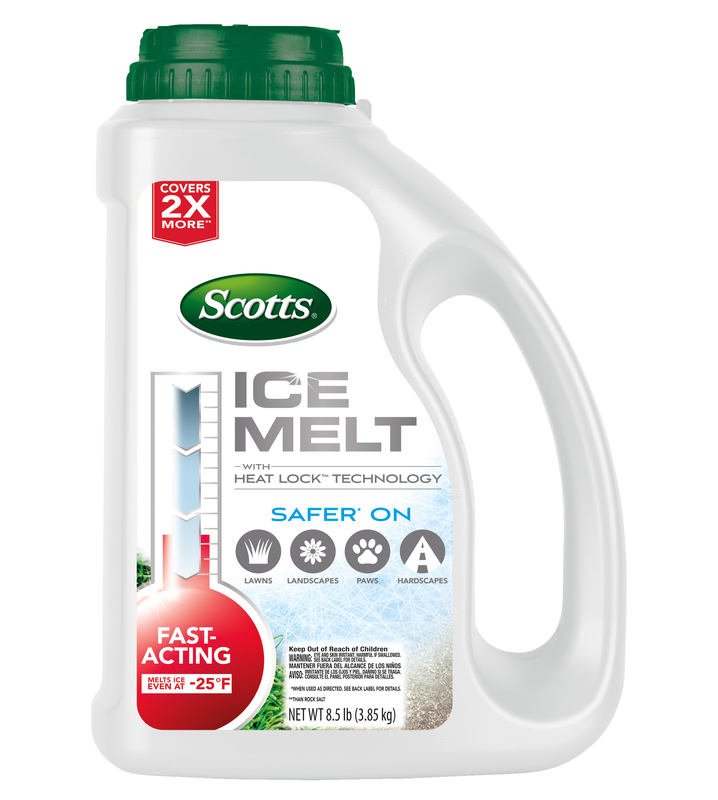 Don’t fight winter weather alone, Scotts® Ice Melt with Heat Lock™ Technology is your secret winter weapon. 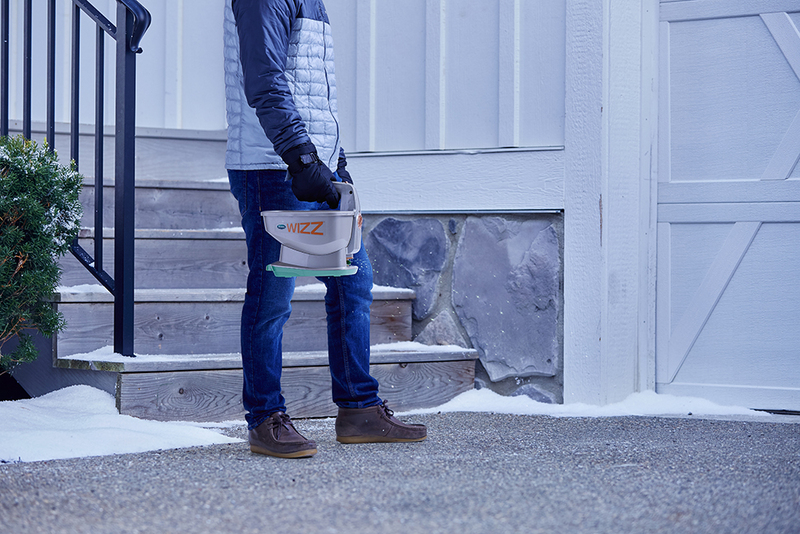 With 4X the melting capacity and 2x the coverage of rock salt, you can use only what you need. The Heat Lock™ Technology Coating keeps hands and paws protected from the calcium chloride core during application while the non-staining formula reduces the potential for damage to your drive and walkways. Apply before, or soon after, the snow starts to fall for the best results, but Scotts® Ice Melt can penetrate ice, even at -25 degrees F. Scotts® Ice Melt is tough on ice, but easy on everything else. Apply Scotts® Ice Melt evenly onto the surface to be de-iced at a rate of ¼ -- ½ cup (2 -- 4 oz.) per square yard, depending on the amount of snow and ice present. For best results, apply preventatively before or soon after snowfall begins, to prevent excessive ice buildup. If snow is deeper than 2 inches, plow or shovel surfaces, before applying product. Apply Scotts® Ice Melt evenly onto the surface to be de-iced at a rate of ¼ -- ½ cup (2 -- 4 oz.) per square yard, depending on the amount of snow and ice present. Wait 5 -- 10 minutes after applying Scotts® Ice Melt to give the formula time to loosen the ice from the surface. Remove melted ice, snow and slush to prevent refreezing. Reapply as needed. 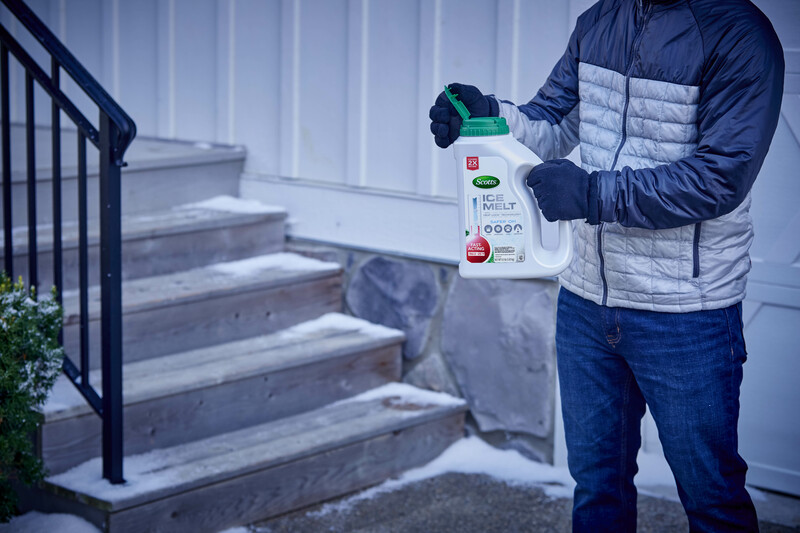 Scotts® Ice Melt is safer than rock salt on lawns and landscapes but like all deicer products, could harm vegetation if applied at an excessive rate. As with all ice melters, this product should not be used on questionable surfaces including stone, brick, wood, pre-cast concrete steps, pre-cast masonry, poor quality concrete, damaged concrete or new concrete less than one year old. Concrete surfaces need to be good quality, air-entrained, properly cured and designed for exposure to winter weather conditions and deicing agents. Consult a concrete professional if you are unsure of the age, quality and curing of your surface. Wait 5 - 10 minutes after applying Scotts® Ice Melt to give the formula time to loosen the ice from the surface. 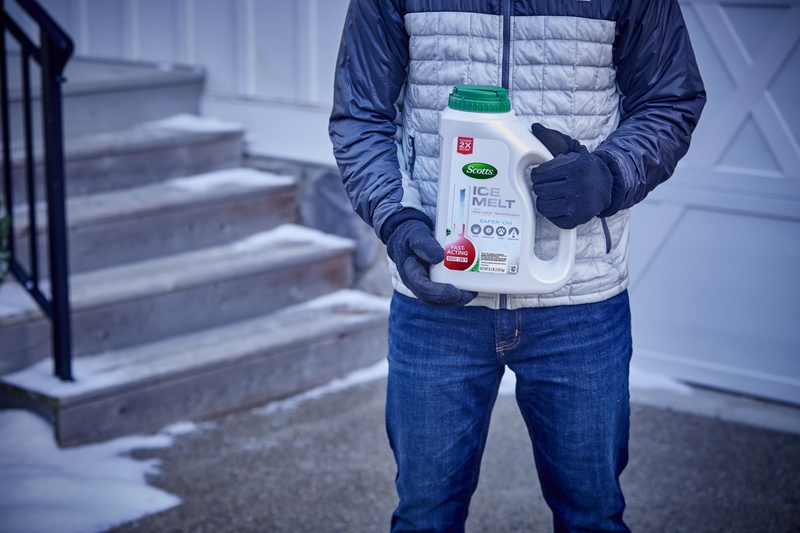 Concentrated formula reduces harm to plants and landscape (vs rock salt) when used as directed. Scotts® No-Quibble Guarantee®: If for any reason you, the consumer, are not satisfied after using this product, you are entitled to get your money back. Simply send us evidence of purchase and we will mail you a refund check promptly. Keep out of reach of children and pets. Once activated, product may cause skin and eye irritation. Not for food or drug use. Harmful if swallowed. Patent pending Scotts® Heat Lock™ Technology coating protect hands and paws until it's moisture- activated technology heats up to quickly penetrate ice. Because it is effective down to 25°F, Scotts® Ice Melt will reduce the number of freeze-thaw cycles the major cause of damage to concrete and other surfaces by rock salt and other deicers. And unlike rock salt and some other deicers, Scotts® Ice Melt will not stain or leave an ugly residue.